Snaps taken with Spectacles can only import to the Snapchat account they’re paired with. 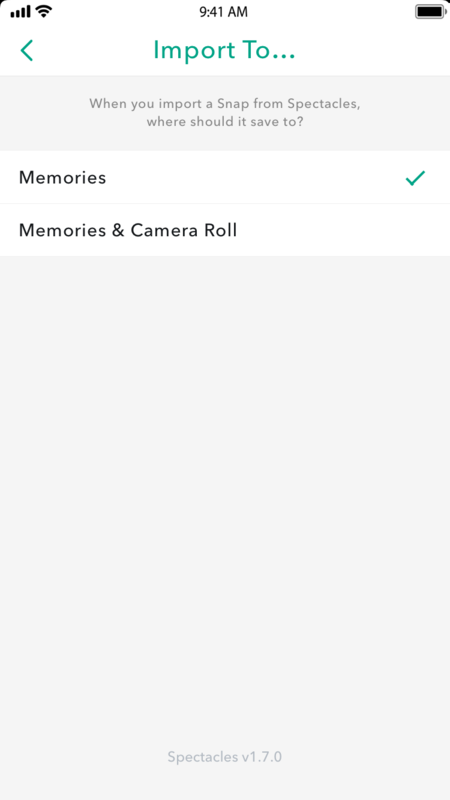 Snaps will import into the ‘STORIES’ tab in Memories. The import process can look a little different, depending on your phone and operating system. Make sure that your Spectacles have more than 10% battery life. Turn on your phone’s Bluetooth and Wi-Fi. Have your Spectacles close to your phone. iOS: You’ll need to open Snapchat, swipe up to Memories, and tap on the ‘STORIES’ to start importing Snaps. Once in the ‘STORIES’ tab, you should see thumbnails of the most recent available Snaps for import. Tap the ‘Import’ button on the right of the thumbnails. If you’re using iOS 11, you’ll be asked to join the Spectacles’ Wi-Fi within Snapchat. Tap ‘Join’ to connect to Spectacles’ Wi-Fi and start importing. If you’re using iOS 10, you’ll need to follow the instructions on-screen to connect to Spectacles’ Wi-Fi. 1) Exit the Snapchat app and go to your device’s settings. 2) Tap on ‘Wi-Fi’ and connect to Spectacles’ Wi-Fi. 3) Go back to Snapchat, and go to Memories to see the import progress. Android: Wi-Fi Direct allows Spectacles 2 (Nico, Veronica, Original) to import Snaps automatically. Just open Snapchat, swipe up to go to Memories, and tap on the ‘STORIES’ tab to see the thumbnails of the Snaps available to import. Importing should start automatically. Snaps will import and sort into Day Stories, starting with your most recent Snaps. A grey thumbnail will appear for Stories and Snaps that haven’t imported yet. To view an older Snap before the newer Snaps import, just tap on the thumbnail of the Snap you’d like to see. When you’re done, new Snaps will continue importing. 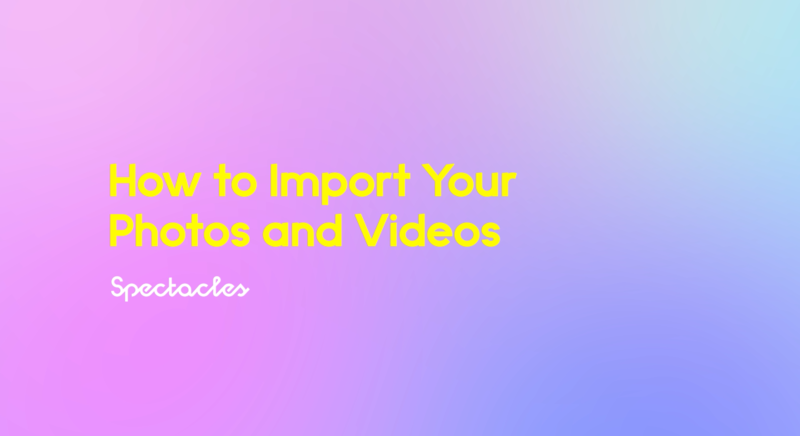 When importing, iOS users will still need to swipe up to Memories and tap ‘Import’ under the ‘STORIES’ tab. Android users will still be able to import automatically. Not seeing any Snaps available for import? Spectacles can only be paired to one Snapchat account at a time. To avoid any potential importing issues, read more about Sharing Spectacles.